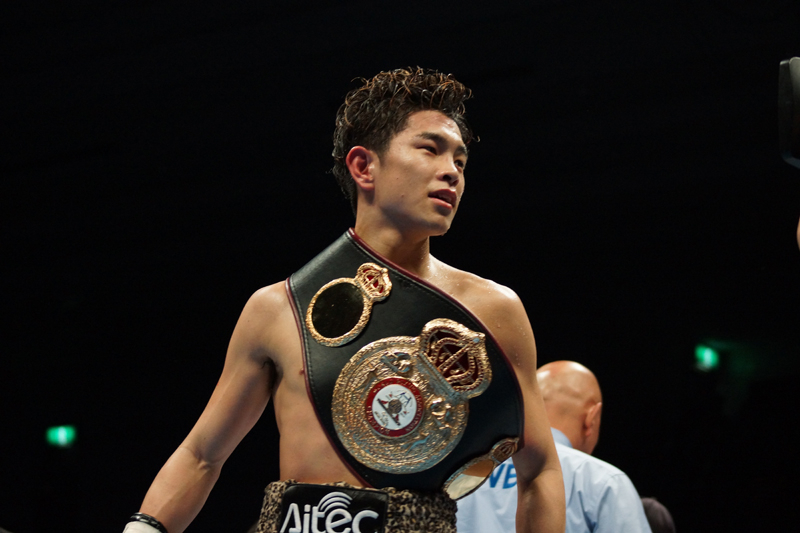 Ioka out points Alvarado in a war! When twi men enter a ring with a combined record of 31-0 (24) you don't tend to expect the fight to go the distance though some how Kazuto Ioka's (14-0, 9) bout with Nicaraguan challenger Felix Alvarado (now 18-1, 15) did just that, even though for much of the fight it seemed impossible that it would last 12. Ioka, defending his WBA Light Flyweight title for the 3rd time this year knew he was facing one of his toughest tests of his career though few would have expected it to be as tough as it was, in fact it was probably his second toughest career bout behind his 2012 bout with countryman Akira Yaegashi. Alvarado, a much vaunted puncher, set the tone of the bout from the off applying constant pressure and looking to hammer away on Ioka with uppercuts, hooks, crosses and almost everything in his arsenal. Ioka, who at first tried to box, met the pressure quickly by standing his ground and slipping shots in the pocket firing back his own accurate counters. As a result of Ioka standing his ground the styles of the two men gelled almost instantly and gave us toe-to-toe action round after round after round which early on made things look extremely competitive. The competitiveness of the early rounds could well have seen the judges with cards 36-40 either way. Unfortunately for Alvarado he was unable to keep up the same level of competitiveness as the bout went on. His shots became pushed, wider, and slower allowing Ioka to pick his counter opportunities more easily and in fact as we entered round 6 and 7 Ioka was beginning to take total control and take advantage of Alvarado's technical limitation and lack of experience. It was never looking easy for the unbeaten Japanese fighter but it was clear he was beginning to run away with the action. Ioka's control of the bout wasn't just helped by the limitations of his challenger but also by the physical damage he had inflicted on Alvarado whose left eye had been swollen from round 3 and twice saw the doctor inspect it, at the start of round 3 and round 10. This swelling seemed to be the closest either man came to being stopped as they each took bombs from the other with out ever being too hurt. By the end of round 11 it was clear that Alvarado was going to need to land something extra special though it was clear that was never going to happen. Ioka was fresh, in total control and seemed happy to fight "Alvarado's fight" as if to say "there is noway you can beat me" and at the end of the day he was right, Alvarado had nothing to worry him down the stretch. Despite being in control however Ioka was happy to trade shots with Alvarado and effectively put on a show for the fans by continuing to fight the challenger rather than get on his bike and cruise. Although a number of rounds, especially early, had been competitive it was clear well before the judges announced the decision that Ioka had retained his title. Alvarado had shown off his toughness though his faults had seen him picked apart some what by a much more complete fighter who may well be looking to really shine in 2014. Yes this was Ioka's 3rd defense of the year though it was the only one where he really needed to impress, it was the only one where he faced a man who believed they had what it took and it was the only one where Ioka answered serious questions about himself. From a fan's perspective we're hoping Ioka gets in with someone like Adrian Hernandez, the WBC champion, or former IBF Minimumweight champion Nkosinathi Joyi in bouts that would be enjoyable. We'd have loved him in with Akira Yaegashi again but the fact Ioka was well inside the Light Flyweight weight limit would suggest that bout isn't going to happen in the next 12 months. Going on this performance an all-Japanese bout with Naoya Inoue would be too early for Inoue though it's a bout that is likely to be spoken about a lot over the coming months.